It is unknown exactly when and where Jan van Eyck was born but the first record of payment to the artist was documented by The Hague in. 1422. 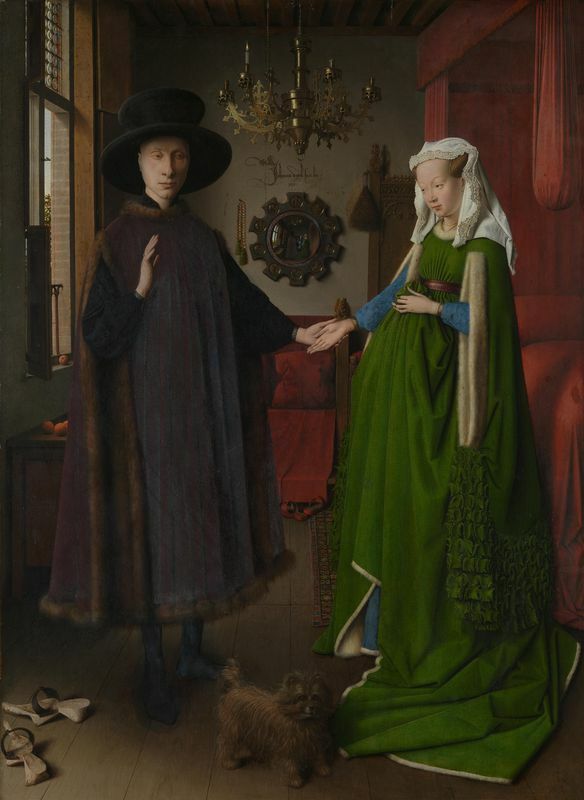 Van Eyck was working for the Count of Holland, John III as the official painter and therefore this puts Jan's birth around 1390 or a little bit before. It's thought he was born in the town of Maaseik. Jan van Eyck had around five brothers and sisters, all of them artists. 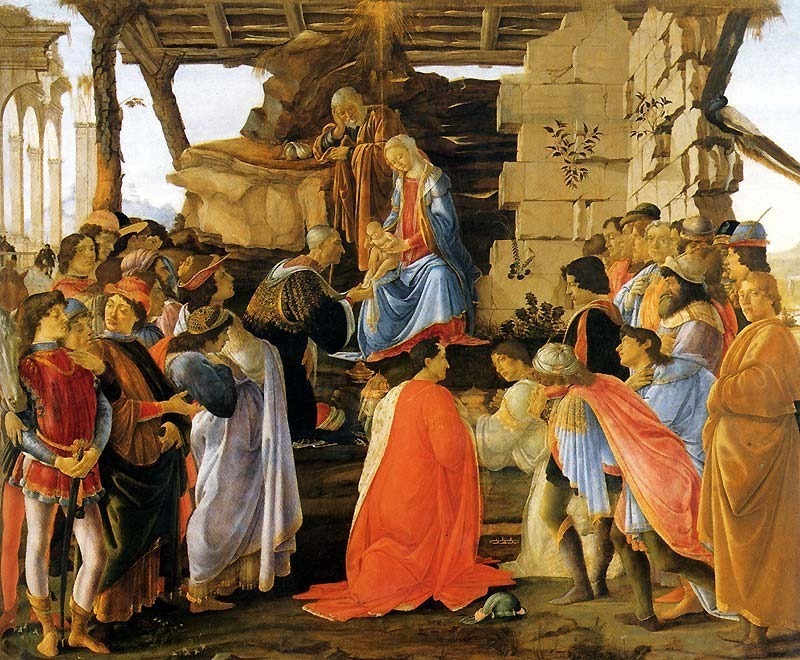 His earliest known work is thought to be Adoration of the Magi which was copied in a drawing. The clothing of the kings dates back to c. 1420. It is unknown where van Eyck studied painting but according to northern European and Flemish tradition, he probably studied under his brother, Herbert. After the Count's death, van Eyck began working for the Duke Philip the Good of Burgundy on May 19th 1425, a patron who would continue to provide financially for Eyck and his family even after the artist's death. 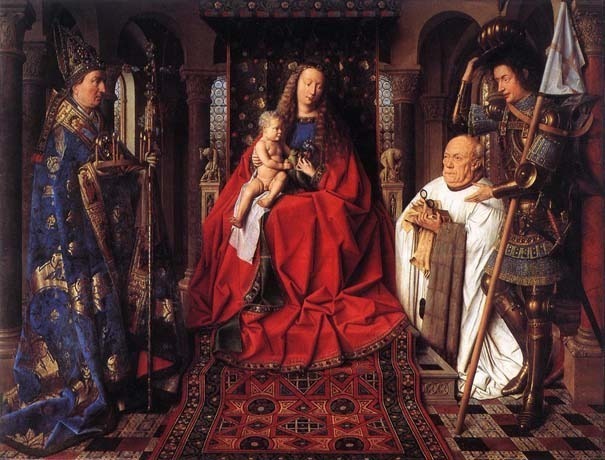 Working for the Duke, van Eyck was probably involved in much more than just painting, such as decorating, engraving, designing costumes, paint shields, stain banners and coloring statues. Jan van Eyck moved to Lille but would soon embark on the first of his many trips for the Duke, including at least two secret voyages. The first voyage was most likely to Italy in the autumn of 1425 where it is suggested that he picked up Italian influences. He spent the next two years in Lille working on decorating the walls at the ducal residence as the building was being redone. 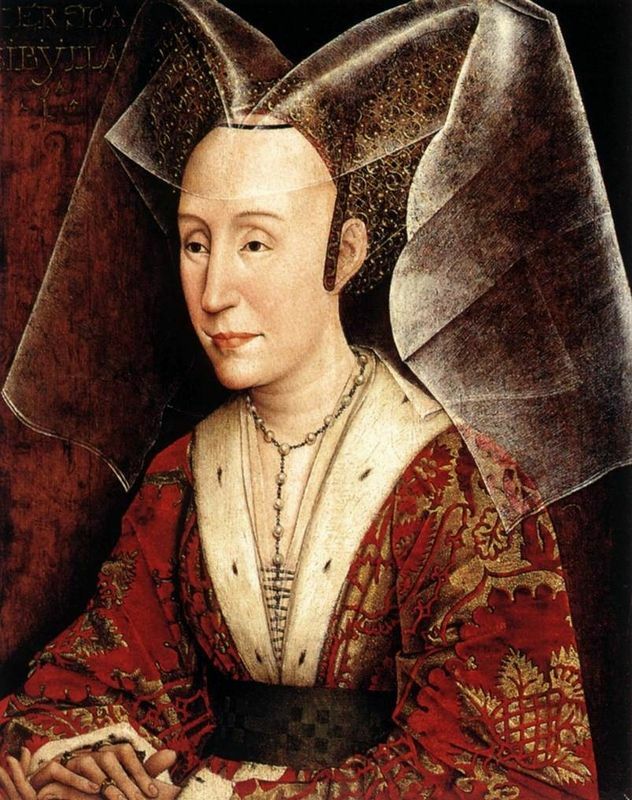 In October 1428 van Eyck accompanied the Burgundian embassy to Portugal. The Duke was asking for the hand of the eldest daughter of John I, Isabella. However, due to a storm, the boat did not arrive to Portugal until December. In Portugal van Eyck painted Isabella's portrait Infanta. He may have painted two versions and sent them back to Philip the Good via two groups, one travelling over land and the other over sea. The group made trips to Santiago de Compestela to visit John II of Castile and Muhammad IX in Grenada. The Duke agreed to the marriage and the party arrived home in December of the next year. In 1430 Jan van Eyck settled in Bruges and began working on the Ghent panels left unfinished by his brother. 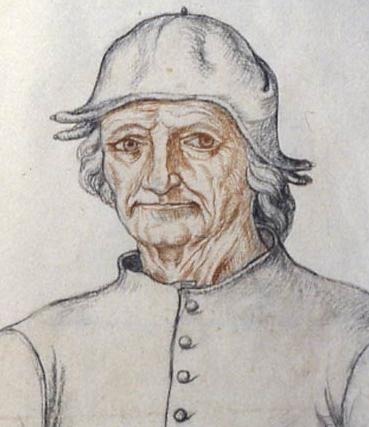 Two years later he bought a house and would stay in Bruges for the rest of his life except for a journey to Arras and a longer journey in 1436, probably to the holy lands. 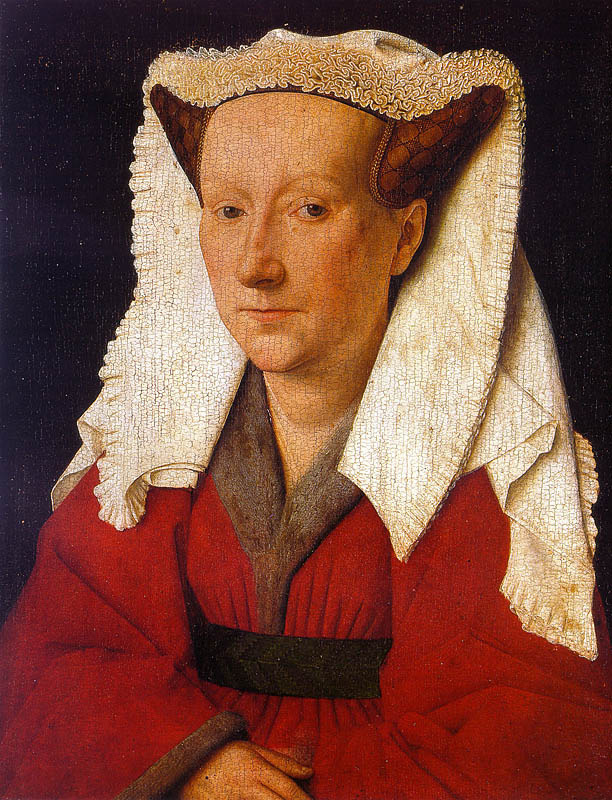 Around 1432 van Eyck married Margaret, of whom there is only one portrait of, and had at least two children. Although under the call of the Duke, Jan received commissions from churches and other persons such as the Arnolfini Portrait of 1434. Around this time he also began to create portraits. Such works are unique as they focus in on the subject with a light source usually from the left. The figures are turned three-quarters towards the light hiding the left cheek in shadow. 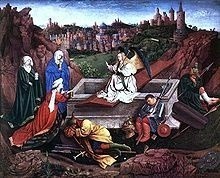 In 1445 Jan was commissioned by Nicholas van Maelbeke to paint a triptych which was never completed. 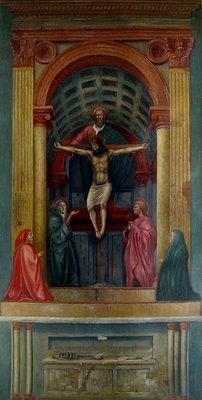 The date of the artist's death is unknown but it's presumed that he died while painting the triptych. Sometimes known as 'the Father of oil painting' Jan van Eyck substantially pushed the use of oils into a new realm. It is unknown where he went to school or who he studied under but it was custom and mandatory that painters train at one of the painter's guilds. It's possible that van Eyck learnt the basics from his brother but he developed a style very much his own. With oil paints Jan van Eyck was able to pursue detail and depict textures and atmospheric light which is evident in all of his paintings. Van Eyck's rich colors stand out and engage the viewer. The use of "impasto" allowed van Eyck to achieve different palettes of color and offer very subtle changes in shading that defined the object. While use of a single light source was becoming popular in the Renaissance movement in other regions, van Eyck was the master in using indirect light reflecting off of surfaces. A single light source therefore became a maze of light and angles. Oil paints were made with heat-bodied linseed oil and exposed to sunlight. This gave the paint a glossy texture and enabled van Eyck to build his paintings layer upon layer. 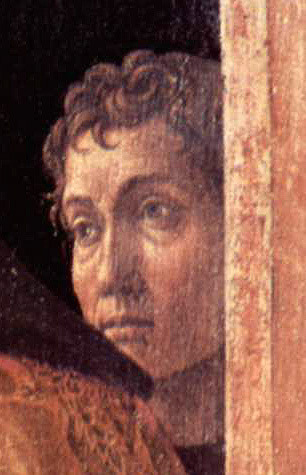 This layered technique was crucial for the development of van Eyck's perspective and the rich coloring as well as the use of light. In many of the artist's works, especially in his portraits, there is a still-life quality. His use of indirect lighting was key in giving his works a mystic feel and setting a smooth tone that spans time. Van Eyck is described as a minimalist. He painted with a very fine brush and it has been argued that at times he painted with a single hair. The amount of detail in the Ghent Altarpiece and the Arnolfini Portrait is extraordinary, with the viewer being able to see tiny figures painted in full detail almost eluding the eye. Also due to the incorporation of oil paint there is a special devotion to textures such as garments, wood surfaces, fruit and other types of metal. The exact types of wood and metal are easily identified thanks to van Eyck's attention to detail. Although lacking the spatial perspective evident in the Florentine Renaissance, in works such as Masaccio's Trinity, van Eyck was able to reproduce an earthly likeness to all his characters and images through a strict adherence to detail. In accordance with Flemish tradition, Jan van Eyck probably studied at an art school and then became part of a painters' guild as late as 1422. It is possible that he did not attend school, instead studying under his brother, Herbert van Eyck. Like Herbert, Jan worked as an illuminator whose influence can be seen in his stunning attention to detail which characterizes his style. 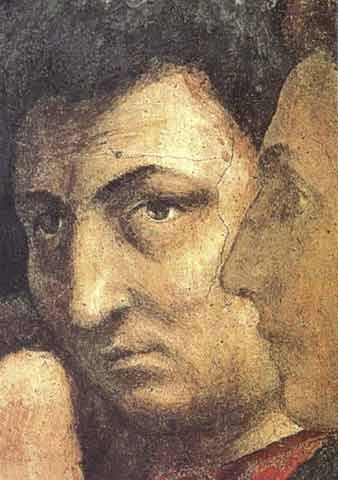 Apart from Herbert, Jan may have drawn inspiration from images and themes from Gothic paintings and possibly Masaccio whom he might have had the opportunity to study while in Italy. 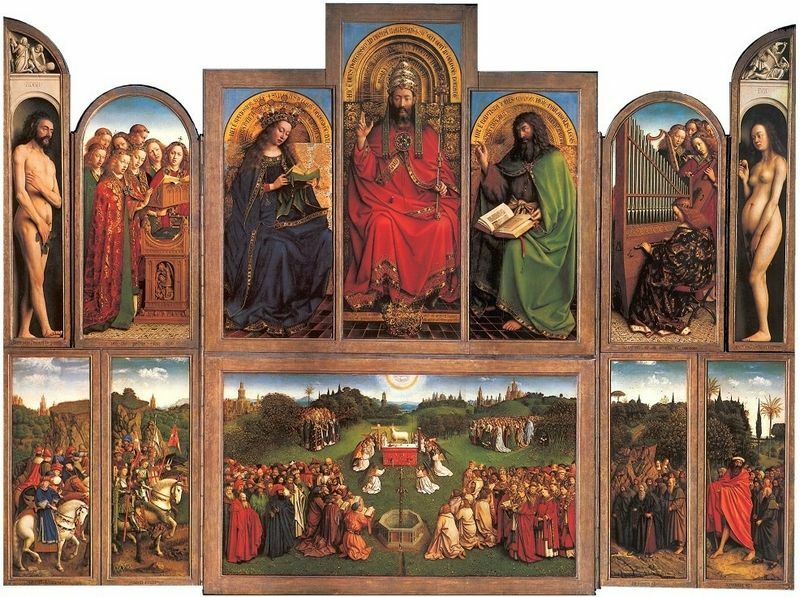 The Ghent Altarpiece was one of the town's monuments and a place painters would come to to study and learn from van Eyck's style. It later became the home of the Ghent humanists' movement. In Bruges, where van Eyck spent most of his adult years, his patterns were used by illuminators and artists for years after. Copying the originals of Jan's work became its own business and imitation of his artworks continued until the end of the 15th century. In the Netherlands Jan van Eyck's multi-figured style was revived in the 1470s influencing Albert Ouwater, the Master of Virgo and Hieronymus Bosch. 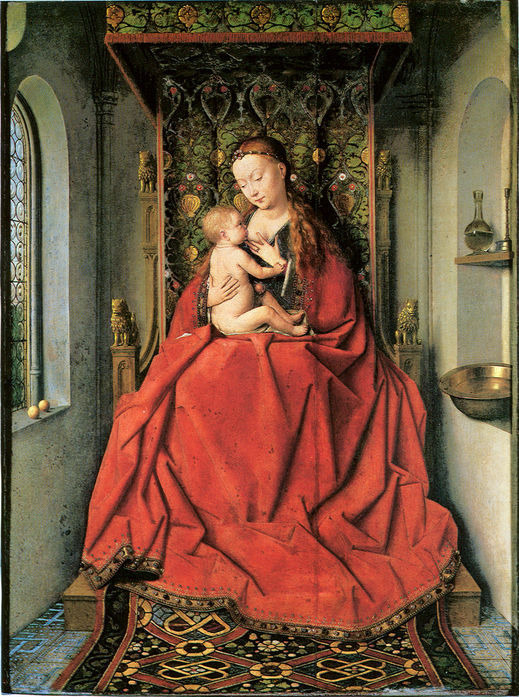 Germany and the Rhineland were not isolated from van Eyck's influence. Konrad Witz in his Mirror of Human Salvation copied Jan's use of isolated figures. 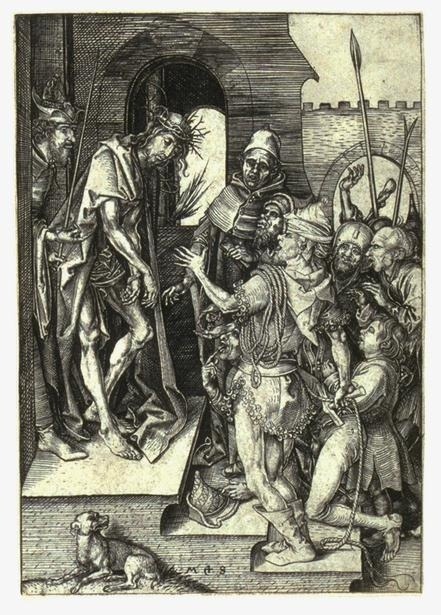 Furthermore, Martin Schongauer made an engraving bearing resemblance to Road to Calvary, although Germany was largely influenced by Rogier van der Weyden. In France, the Bedford Master copied Jan's work in his Dunois Hours and Book of Hours. The painter Barthélemy d'Eyck probably visited Jan's shop and incorporated his style into his own panels, like Virgin. Jan van Eyck was one of the first northern Europeans to have influenced Spanish art. Lluis Dalmau and Lodewijk van Hallynckbroot were both working in Spain and were said to have studied his paintings. Van Eyck influenced Italian paintings much more than any other country (excluding the Netherlands). His oil technique can be seen in St Francis Giving the Rule to the Franciscans by Niccolò Colantonio. Ruler of Naples, Alfonso V, was said to have acquired van Eyck's St George (untraced) and the Lomellini triptych and a copy, or the original, of Philip the Good's Mappa mundi (Sterling). These paintings were greatly admired and copied by Colantonio and his assistant, Antonello da Massina, who painted St. Jermone in his study. Jan van Eyck's oil paintings have influenced artists in both northern and southern Europe. Having been recognized early on for his skill, he was hired by Count John of Bavaria and the Duke Philip the Good of Burgundy, and was paid very well. His work was highly regarded by Italian painters as well as those from Spain, Germany and France. In a 1454 biography, Bartolommeo Facio named van Eyck "the leading painter" of the time. In the 19th century Jan van Eyck's work had been used to judge other painters by critical methods, as he was one of the first Flemish primitive artists. Recent discussion around van Eyck's work has lent itself only to iconography such as that in the Arnolfini Portrait, partly due to the enormity of interpretation of his work. Like Masaccio in Florence, Jan van Eyck is looked upon as the founder of the Ghent humanists and the Northern Renaissance. To find out more about the life and works of Jan van Eyck please refer to the following recommended sources.